Fifteen points from the boot of fly-half Jonny Wilkinson handed England their first victory over the All Blacks on New Zealand soil for 30 years. Despite being reduced to 13 men mid-way through the second-half, Clive Woodward's side held on to cement their reputation as the world's number one ranked team. Five years ago England were defeated 64-22, but there was no repeat in Wellington. Before the game, Woodward had asked whether his side could make the step up from the Six Nations. The answer was a resounding 'yes'. After a poor first half, the tourists met the challenge of the All Blacks head on and Wilkinson's prodigious boot ultimately proved the difference in difficult conditions. A late Doug Howlett try gave the home crowd something to cheer, but when the final whistle blew, the All Blacks knew they had failed to capitalise on their advantage. It was not a vintage England performance and they struggled in almost every phase of play. But they stood tall when it mattered most and held on to extend their winning run to 12 matches on what will rightly be regarded as one of the greatest days in English rugby history. All Black fly-half Carlos Spencer endured a terrible start when his kick was charged down by Ben Kay yards from the line. Wilkinson slotted the resulting penalty to hand England the early advantage. With rain sweeping around the ground, both sides made a number of unforced errors, before Spencer was given his chance to level the scores after Kay was penalised for dragging down at the lineout. His kick drifted wide but he made no mistake moments later when Jason Leonard was caught offside. From the kick-off, the Kiwis again started strongly, but were punished for failing to complete their phases when Wilkinson slotted a superb 50 metre penalty into the wind. Time and again the home side failed to break the white wall and it was no surprise that the last score of the half again came from the boot, after Neil Back was caught yards offside in front of his own posts. England returned from break without Jason Leonard, who was replaced by Phil Vickery. Wilkinson was given an early opportunity to again test his kicking skills and, true to form, slotted yet another long-distance effort. 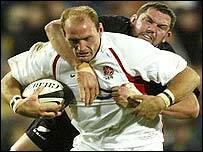 With both sides notching up numerous penalties, referee Stuart Dickinson finally lost his patience and gave both Neil Back and Dallaglio their marching orders. Moments later, Rodney So'oailo crossed the line to huge Kiwi cheers, but his effort was disallowed for a double movement. Despite being two men down, England began to hold on to possession and Wilkinson even extended their advantage with a delicate drop goal. The All Blacks needed to hit back quickly and they managed just that when Spencer's long hack ahead was chased superbly by Howlett who touched over to the delight of the home crowd. Spencer slotted the conversion to reduce the deficit to just two points, before missing a straightforward penalty. The closing stages were frantic, but when the final whistle blew, the England players had created their own slice of history with a result that will send shockwaves throughout the rugby world. New Zealand: D Howlett; J Rokocoko, M Nonu, T Umaga, C Ralph; C Spencer, J Marshall; D Hewett, A Oliver, G Somerville, C Jack, A Williams, R Thorne (capt), R McCaw, R So'oialo. Replacements: M Muliaina, D Carter, S Devine, J Collins, B Thorn, C Hoeft, K Mealamu. England: J Lewsey; J Robinson, W Greenwood, M Tindall, B Cohen; J Wilkinson, K Bracken; G Rowntree, S Thompson, J Leonard, M Johnson, B Kay, R Hill, N Back, L Dallaglio. Replacements: D West, P Vickery, S Borthwick, J Worsley, A Gomarsall, P Grayson, D Luger. "It was a very, very strange game"
After beating New Zealand, will England win the World Cup?